This is from a New Century Telecommunications promotional three-ring binder, sent to television stations for them to order movies to show on T.V. On heavier stock paper, these are two-sided and measure 8.5" x 11". The photo below shows the front of the card (there are three holes along the left-hand edge so it can be put in the binder). 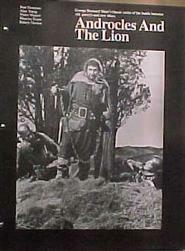 The back is white with one black-and-white photo from the film, a brief plot synopsis and cast list as well as a quote or quote from a contemporary review (The New York Times, Newsweek, The Saturday Review).